Our Annual Trip, this time to the province of Gerona As always we try to, and, include in our itineraries something for everyone. Whether it is beautiful scenery, local history, culture and gastronomy and for our artist and photographic Members great opportunities, this time, without doubt, we succeeded on all counts. Not without several problems during planning, however. We had originally booked with Vueling to travel on the Sunday flight only to be informed some time later that they were cancelling all Sunday flights. We therefore arranged the departure date a day earlier and what did Vueling want, only an extra 15 €uros per person. All excursions were then rearranged around this new departure date only to be informed a week or two later that there was to be a general strike on the day of return. We were assured that the flight from Barcelona would be operating as it was one of the Guaranteed Minimum Services to the Islands. However our contracted coach company would not risk operating on this day to provide our excursion to Montserrat and transfer to the airport in the afternoon for fear of vandalism to the coach as previously experienced. Another period of headaches and sleepless nights until we proposed hiring sufficient self drive cars to take us the one way from Gerona to Montserrat and then to the airport. After a reimbursement from the coach company the extra for the one way hire was subsidised from the association’s funds. We have got to add that National Hire Cars booked through Holiday Autos were absolutely superb in their service. The day of departure and we are all at Mahón airport to check in for our 08.35 flight to BCN, with on time arrival at Barcelona and our coach driver waiting at arrivals with the Menorca Britannia placard which we easily spotted. Our 75 minute transfer to Gerona and the Hotel Peninsular in the heart of the city passed like a flash. What a superb little hotel in a great location in the heart of the city and within a 5 minute walking distance of everything. We now had time to settle into our rooms and take a lunchtime snack before we met our city guide, Ana, at 3.00 PM in the hotel reception for our guided tour of the Casco Antiguo. Gerona is a fascinating city with so much history and marvellous medieval buildings. The Jewish quarter and the Christian part cheek to jowl. Ana definitely gave us our money’s worth. As we had purposely booked on a bed and breakfast basis so as to enjoy the multitude of restaurants close by, each evening was spent happily searching out a favourite and then comparing notes the following morning. Day 2 and after breakfast the coach arrives at the hotel together with our guide for the day Veronique, a Belgian lady who had lived in the province for some 30 years. 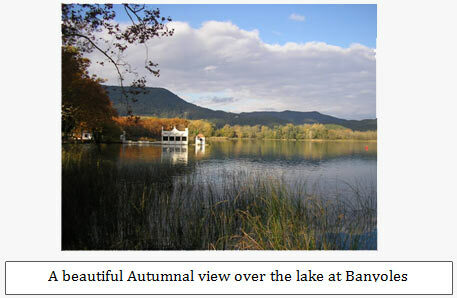 Heading inland through beautiful scenery our first stop for a few minute was at Banyoles famous for its lake in the crater of an extinct volcano. This lake is horrendously deep and apparently fed from underground streams from the Pyrenees. Used for training rowers for the Olympics with serious rowing clubs. In spring time the water can be a lot higher than this from the melting snows of the distant mountains. We are then entering very scenic countryside, the ancient volcanic area being very apparent with the cone shaped hills of extinct volcanoes. We stop at the wonderful medieval village of Besalu. Walking across the bridge which used to be gated was like stepping step back in time. Everyone wished we could have spent more time here but after time to see most of the village it was back on the coach and we commenced a remarkable journey climbing through narrow roads over ancient lava fields between the magnificent autumn colours of the deciduous trees. Here were forests of maples with leaves of golden to scarlet, something we don’t see in Menorca, and thick, lush vegetation. We arrive at Mare de Deu del Far, our planned lunchtime stop. This is something else. Having already used up most of the superlatives most of us were speechless with the magnificent views from this volcanic ridge, a vertical cliff, thousands of feet high above the surrounding countryside way below. A delightful lunch of local specialities was taken in the very popular restaurant at this obviously favourite spot for the locals and those “in the know” before retracing our route back to less dizzy heights through ever changing colourful countryside to Rupit. 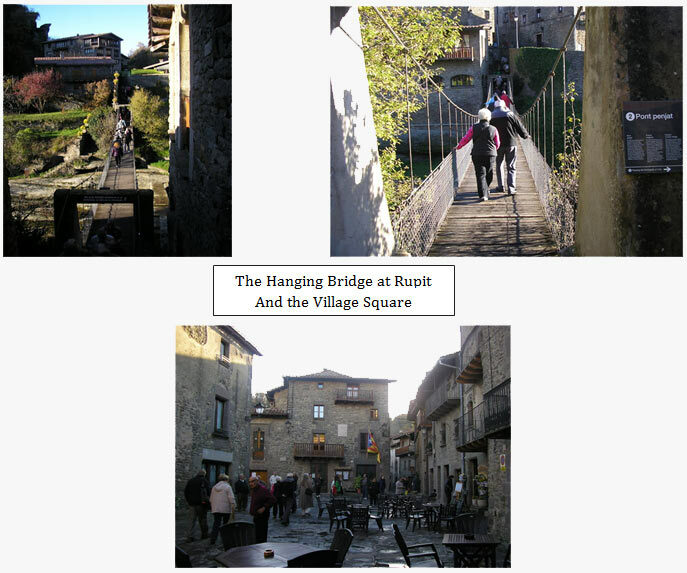 Even more medieval than Besalu in the morning we entered the village over a rope bridge swaying over the river gorge. No more than ten at a time on this bridge, a bit of a “white knuckle” adventure for some. After free time to browse the village walking on narrow streets of smooth lava it was time to re-board the coach and return to Gerona as dusk was settling over the countryside. A group of excited but weary people arrive back at the hotel after an amazing “full on day” of lasting memories. Day 3, and an altogether different concept. Tony, our coach driver from the previous day and who was to become our mentor and friend over the next two, arrived at the hotel to take us to the famous resort town of Blanes. This time, and for the following days Bryce and Sheila were to be our guides. Blanes is a seaside resort and hugely changed since Bryce and Sheila had a first foreign holiday here in the mid 1960’s. But we weren’t here for the beach. Blanes is home to the famous Karl Faust Botanical Gardens, “Marimurtra” and as most of our members are keen Mediterranean gardeners this was a special journey for them. With its many acres of landscape perched high on the cliffs overlooking the azure sea of the Costa Brava this was an interesting and relaxing venue after the previous day. The gardens cannot be reached by coach and is only accessible up the winding hillside streets by a tourist train. After a lovely morning it was time to take the train back to the town where we had free time for a snack lunch and, for some, a paddle in the sea before making our way back to the hotel for a well deserved siesta. Day 4 and a complete contrast. Today we started earlier in order to fulfil a promise not to miss a visit to the famous chocolate factory of Torras, the manufactures of Spain’s finest. This had to be missed on the first day as it was a Sunday. We viewed a short video explaining the history of the company and production methods before viewing this small factory and visiting the on-site shop. Most of us are still secretly gorging, I think! However this was a day for lovers of art. No visit to the province of Gerona can miss out the legacies left by one of its most famous sons. Dali. Firstly we made our way to the tiny medieval hamlet of Castell de Pubol, for a timed visit to the Casa Gala Dali. This medieval castle was totally refurbished and modernised by Dali as the home for his beautiful wife Gala and an isolated retreat from his celebrity life style and his home during his latter years. Wonderful and, in some cases, somewhat curious artefacts adorn this house. This man was a genius and widely known as completely eccentric. However talking to an elderly gentleman in the small village bar he emphatically refuted this. He had been Dalis’ chauffer and his wife the housekeeper. He says that the couple were charming and that the eccentricity was an act that Dali performed for the press and publicity. We then proceed to Figueres, Dalis’ birthplace and the home of the Teatro Museo Dali. Situated in the reformed old theatre of Figueres the building itself is something like no other, a foretaste of things to come. What can we say, a complete mix of eclectic art, sculpture and miscellaneous items. How can one man accomplish so much in one lifetime and this was just here, what about the innumerable works around the world in private collections. Some you love, some you hate, but all made you question and the brain cells work overtime. Art is in the eye of the beholder they say, here was something for everyone and one could not be anything but overawed at the sheer audacity of this famous artist. We are sure that some of our artistic members have drawn inspiration for their future work. Watch out! The last day, an early check out from the hotel and pick up the cars from the station car park (we had already been given the keys the previous evening) Setting off by 8.00 am to avoid any problems of congregating demonstrators and road closures due to the general strike. 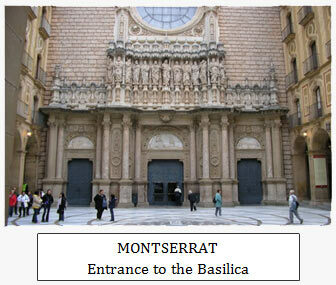 With copies of the map and route plans we made our way individually to Montserrat some 1½ hours drive. No trip to the area should miss a visit to this amazing Monastery situated about 40 minutes north of Barcelona. With plenty of time to view the Basilica, the grounds and the unusual surrounding peaks from which, again, there are stunning views towards Barcelona and the sea. And time for lunch, before setting off to the airport for our flight home. Dropping our passengers at the terminal before the drivers filled the tanks and returned the cars. Checked in and once through security amazed to see an almost deserted terminal. Only a handful of flights operating but all the shops and restaurants were open. As promised, our Vueling flight boarded and left on time bringing to an end a very successful trip away. From the itinerary we proposed we have to thank Gundi Graf at Viajes San Luis for overcoming all the frustrating problems and the hard work she had to do to accomplish, together with ourselves, to put together a non standard trip which we believe will have lasting memories for all our members who participated.